I love animals. Who doesn't? Cats, hamsters, penguins, dinosaurs, dogs, bats, rhinoceroses... Wait... Rhinoceroses? Yup. Rhinos. They're the second-largest land animal on earth and very, very endangered. And I didn't know a thing about them until I read this book. Emi is a Sumatran rhino, one of the most elusive of the five species of rhinoceros. She lives at the Cincinnati Zoo where zoologists were hoping to breed her. Dwindling natural habitats and poachers have knocked the number of Sumatran rhinos down to somewhere around 300 in the wild. One hope to preserve the species is to breed them in captivity and eventually release them into protected areas. The only problem with that is that it is very hard to get a Sumatran rhino to breed in captivity. Before Emi, the last Sumatran rhino born in captivity was over 100 years ago. And Emi needed some help. When her first several pregnancies resulted in miscarriages, rhino scientist Terri Roth stepped in. The book explains different techniques Terri used to help Emi give birth to the first captive-born Sumatran rhino in over a century. 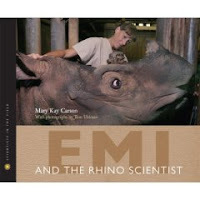 The book also gives lots of information about rhinos, why they're endangered, and how people can help to save them. It's brimming with full-color photographs (man, baby rhinos are cute!) and includes profiles on each of the five species of rhino. I found these to be especially illuminating because accompanying each profile was an illustration showing their previous habitat range and the teeny tiny areas where they can currently be found in the wild. It was... sobering. Emi is perfect for your budding zoologists and conservationists (and hey, Earth Day is nearly around the corner!). I've enjoyed the few Scientists in the Field books that I've read and I'm looking forward to starting the stack I've got checked out from the library! Happy Nonfiction Monday! Go check out Anastasia's round up. It's always the highlight of my Monday. This looks like a fantastic book - thanks for the review! I'm so glad I found your blog through the Nonfiction Monday roundup.